IMG_3328, a photo by aghrivaine on Flickr. Here we are - exactly one year later. 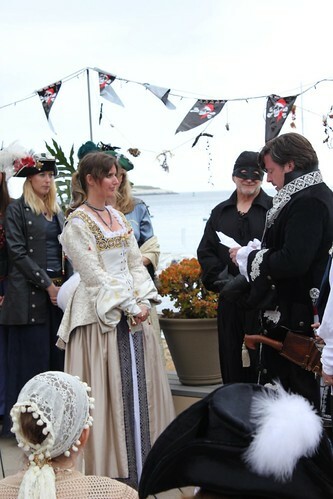 Here's a picture of me reading the vows below to you. You look dubious in this picture, I hope the intervening year has inspired a little more faith! My heart will be yours forever; with love and compassion given freely and always. From you; my inspiration in all things; every journey of discovery or excellence will find its end just as it began, with you. For our family, I will be always learning; and I will share what I learn to everyone’s benefit. I take your family as my own, and will defend and support them as the blood of my blood. As I love you, I will love them, and as our family grows I will be ever more blessed with a greater sum of love. For our friends, I will share always with you our adventures and interests together. The circle of people we love make our joys more joyous, our woes more bearable, and every experience more vibrant; the strength and joy you give me I will share with them to return to you ten-fold. The people in our life together have enriched every blessing we share; we are fortunate for their wishes and work today – I honor them as they honored us, and all in the name of honoring you. Finally finding my heart of hearts. And all the sum of my parts. I love you too, always and forever. This year has been wonderful and everything keeps getting better. And that dress is GORGEOUS. Love it. Many happy congrats on the anniversary! *sob* What a lovely sentiment that last part was!